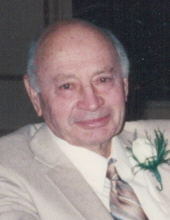 Celebrating the life of Frank V. Waltermeyer Jr.
Obituary for Frank V. Waltermeyer Jr.
Frank V. Waltermeyer Jr., 97, of Fostoria, passed away at 7:05 pm Tuesday November 20, 2018 at Good Shepherd Home, Fostoria. He was born August 13, 1921 in Fostoria to the late Frank P. and Alta K. (Stykemain) Waltermeyer. He married Ellen H. Mackey November 25, 1948 in Fostoria and she died January 26, 2015. Surviving are children, William G. (Karen A.) Waltermeyer, Fostoria, Don E. (Kate M.) Waltermeyer, Perrysburg, Janet S. (Michael A.) Claus, Perrysburg and Ed L. (Gail) Waltermeyer, Canal Winchester; grandchildren, Joe (Susan) Claus, Andrew Claus, Bill (Mollie) Claus, Mary Claus, Ashley Waltermeyer, John, James, William, Matthew and Daniel Waltermeyer; great-grandchildren, Ryan and Ellen Claus; sisters, M. Regina Bennett, Toledo and Joanne E. Valenti, Fostoria. He was also preceded in death by brothers, Robert, Edwin and Jimmy Waltermeyer. Frank served four years in the US Coast Guard during WW II with his final 18 months in the Pacific Arena. He was a skilled plumber, pipe fitter and an all around handyman. He was a member of the VFW, an avid golfer, fisherman and loved to travel. Visitation is Monday November 26, 2018 from 10-11 am at HOENING & SON FUNERAL HOME 133 W. Tiffin St., Fostoria, Ohio 44830. Military honors by the Fostoria United Veterans will take place at 11 am at the funeral home. Pastor Jerry Copeland will follow with words of reflection. A luncheon will immediately follow in the funeral home. Memorials are suggested to the Fostoria United Veterans c/o the funeral home. The Waltermeyer family wishes to extend a heartfelt thank you to employees of the Cascades Unit, supervisor Kim, Pastor Jerry Copeland, Rev. Todd Dominique and Ohio Living Home Health and Hospice for all the kindness and fine care given to Frank. To send flowers or a remembrance gift to the family of Frank V. Waltermeyer Jr., please visit our Tribute Store. "Email Address" would like to share the life celebration of Frank V. Waltermeyer Jr.. Click on the "link" to go to share a favorite memory or leave a condolence message for the family.